Growing up in this house, maps were ever present. Through all of my childhood there was a map table (and that’s just what we called it, “the map table”) in the kitchen. It was the size of a card table. The top was a white square block of plastic. Atop it, well protected by a film of clear plastic was a colorful world atlas. In the living room was a globe. To us children, the globe was fascinating as a ball that could spin in various directions but that was trapped in the framework of two arms and a base that prevented it from rolling. I was a toddler when I first played with the globe. As we got older, my mother would tack maps on the walls of the kitchen if one of us were traveling or if a political event (including war and coups d’etat) were occurring anywhere in the world. She’d mark points of interest with plastic tipped colored pins. Letters from a sibling traveler would be nearby so that we could read about the region of the world that they were passing through. 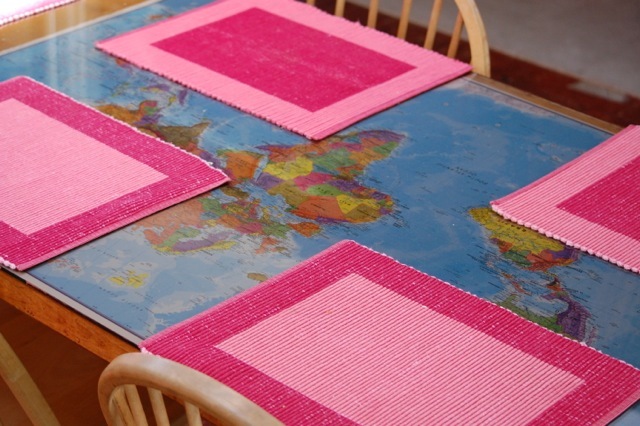 Now, as I sit for each meal at the table that was my mother’s up until 17 months ago, my eyes scan a current day world atlas that she put under the glass that protects the finish on the kitchen table. Despite all this exposure to maps in my childhood, my adult geography knowledge needs much brushing up. So I’ve been studying closely the region surrounding my placemat. Alaska is huge. The Aleutian Islands are like a spine reaching out to Russia. I now know precisely where the Yukon is. And the Rocky Mountains spread high into Canada, to a point where I wonder why the Mackenzie Mountains have a different name, as they look to be part of the Rockies. Canada is enormous and seems to be about 50% water. I’ve wandered to other parts of the atlas world, too. I’m working on memorizing that “Guyana” is part of South America while the similar sounding “Ghana” is in Africa. It’s all well and good to see the spelling and note the distinction. But I once met a fellow writer from “geehahna” and I’m afraid that her saying twice more didn’t make clear to me if she were from Africa or South America and I was too shy with my self imposed embarrassment to ask. I’ll next be working on the locations of: Guinea, Guinea Bissau, Equatorial Guinea, and New Guinea. My mother, who was not college educated, as I am, knew all these things, cold.